optimism which attack everybody in the trenches"
[WWI Resource Centre's Dr. M. Geoffrey Miller writes: My daughter presented me with an original book of letters from a subaltern (junior officer) in a Highland Scots Territorial Regiment, serving at Flanders from 1915 during the 2nd Battle of Ypres (where the Germans first used chlorine gas on April 21st). The letters continue until July 1916 when he was evacuated home. He was wounded twice. The book consists of letters to his wife and describes some of the everyday events that he and his men had undergone. It was published in 1917 under the title of "Temporary Heroes" by The Bodley Head. The author is "Cecil Summers" but he has changed all names, including his own, and the letters are from his Nom de Plume "Thomas" to his wife "Phillis", the book being dedicated "To The Only Phillis". On the flyleaf is written "October 1918 - from A.D." The letters are described in the Foreward as "The impression of the moment and are subject to the fits of depression and optimism which attack everybody in the trenches". Norman Sommers' letters give a very real impression of what it was like to serve as a subaltern in Flanders during this period. After the war he continued to write humorous articles for such English magazines as Punch, which never gave author's names, and London Opinion where he still wrote as "Thomas". 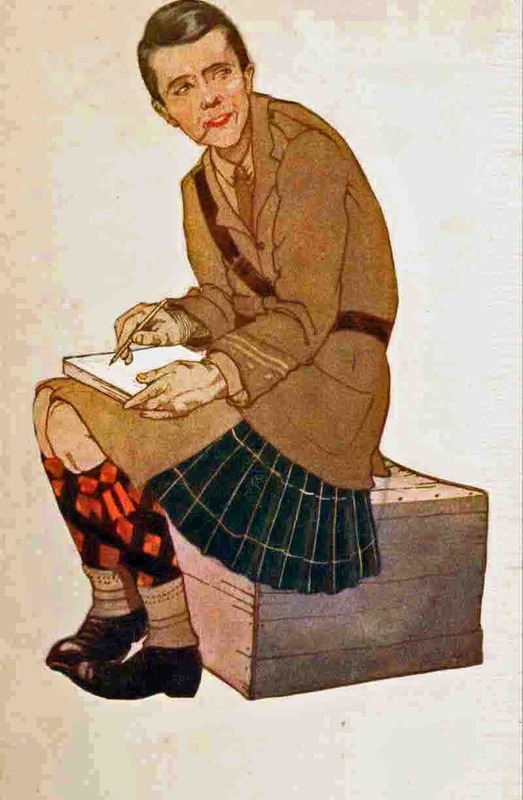 Research by members of the WWI-L list has discovered that the author's real name is Norman Cecil Sommers Down who was initially a Lieutenant and then a captain in the Gordon Highlanders. These are strenuous times indeed. It's well over a week since we came up here, and this is the first opportunity I have had of getting off a letter. We had rather a thrilling march up, and made all the more thrilling by the probability of having to make an attack at the end of it. We felt rather like making one after what we had seen on Hill 60, and we should have had to do it, too, only something went wrong with the Staff work. Along the none too wide road four streams of traffic were passing., on the outside, to the right, were we marching out. jostling us and moving in the same direction, clattered long lines of ammunition limbers, British and Belgian, the latter reminiscent of country bakers' carts manned by semi-equipped emergency, postmen. With them went convoys of motor ambulances. Coming the other way the same limbers and ambulances, but now the limbers were empty and the ambulances full. And on the far side of the road straggling little groups of weary men, some of them hardly able to breathe from the effects of the gas. Through it all buzzed the dispatch riders, twisting and turning among the horses with unbelievable skill As we marched the men sang, sang as only Scotch troops can, snatches from Harry Lauder chiefly, strangely beautiful, despite their music-hall origin, and fine tunes to march to. The troops bivouacked just off the road, crowded on to its grass border and watched us pass. "Ullo, Jocks," cried one humorist. "Ah've seen a good few battalions march up that way, but preshus few come back." Which, though true, was hardly cheering, was it ? Gradually the traffic began to thin out, but we carried on, the men still singing. After a time we 'Were alone---save for two "Archies" and their attendant ammunition lorry. There is something very attractive about their curiously shaped guns, which look for all the world like giant triple telescopes. Then a great grey armoured ear whizzed by, the Dreadnought of the land, with R.N. in large red letters on its body, bringing with it a breath of ozone. At last we reached the outskirts of Ypres. At the bridge where the sentry stands, guarding the ruined city from the hand of the looter, the pipers turned aside and broke into "Hieland Laddie." From the men came what a journalist would probably describe as a "deep-throated roar," and for the life of me I can't give a better word for it. In it blended the voices of the business men, students, clerks, artisans, of labourers, stevedores, and all the other classes which go to make up the battalion. As we entered Wipers it died down, for who could be aught but silent in that city of the dead? Past the Cloth Hall, past the Cathedral, past shops and houses now little heaps of crumbling brick, through the Menin Gate, across the moat, and out into the Salient. The men we relieved had been cut up even worse than the Hill 60 lot, and as they had been driven back by the gas we found ourselves taking over open positions behind hedges instead of trenches. The men, of course, were dead fagged by the time they got there, but we had to set them to dig themselves in without a moment's rest. Poor devils. But at dawn we were so far down that the Hun, had only our head and shoulders to pot at instead of our entire weary anatomies. Since then we have spent the time being shelled by their artillery. Yesterday we had thirteen hours of it without a moment's respite. By night we, try to rebuild the trenches which have been blown in by day After the Germans have been shelling us for an hour or so our own artillery will reply with one round of shrapnel, generally a "dud." But of course that isn't their fault. If only the B.E.F. could lay hands on the man whose fault it is, he would have a pretty rough crossing. Was out in No Man's Land last - night firing rifle grenades. It was creepy work out there in the long, wet grass, in which you kept on running against dead bodies. To my dismay they all failed to explode, and it was not till we got back safely that I remembered that I had not pulled out the pins! And at a guinea a time that's hardly helping to win the war, is it? We hear (i) that our depleted battalion is shortly to return home to recruit, (2) that all T.F. battalions are to be withdrawn from the firing line, (3) that we are to do an attack, (4) that we are to form the nucleus of a new conscript battalion, (5) that we are going to Rouen to dig drains. There's a fine selection for you. Take your choice and it's certain to be untrue. Meanwhile here are we stretched across the road to Ypres, and holding what is probably the most important part of the whole line. With which cheery thought, farewell. Still here, and no word of being relieved. That's only nineteen days that we've been in the front line without a relief, and we haven't lost more than two hundred men during the time, so we aren't, doing so badly. All the same, life's hardly worth living. From dewy dawn till the stars begin to peep the Hun shells us, shell after shell the whole day long, and we just have to sit and look pleasant. Our own artillery do their best, but all they can do is to polish their guns and think how nice it would he to have something to fire out.of them. If only we could have the man here who said that there was no shortage of shells. I'm not being very cheerful, am I, but at present I am suffering rather badly from lack of sleep. This morning after "stand to" I told my servant to make me a cup of cocoa. Before it was ready I had fallen asleep and he had to wake me. 1 took the cocoa from him and tried to drink it, but it was too hot, and so 1 sat down and waited for it to cool. I must have fallen off again directly, as I woke up with a start to find scalding liquid trickling down my kilt and on to my bare knees. I didn't want to let my man see what a fool I had made of myself, so I raked up an old Tommy's Cooker and put a dixie of water on it. My dug-out was on fire when I woke up again, and I had to use all my remaining water to put it out. After this I gave up all idea of a hot drink and went to sleep on the sopping floor of the dug-out. Five or six hours later a small earthquake roused me to the fact that all around me was dark. This was astonishing for midday in June. A shell had closed up the dugout door, an ungentlemanly thing to do, but better perhaps than coming in through the door. When. my men dug me out they told me that this sort of thing had been going on for over an hour, and that they had retired to the far end of the trench, and had wondered why I didn't do likewise. You remember me giving you a lengthy account of a most obnoxious fellow, don't you? Well, he has left us. His going was thus. One of our positions, an advanced one, is some distance ahead of the rest, and listening posts have to. be placed all round it by night. My pet aversion went out to visit them last night as it was his tour of duty. He should have known where they were, but apparently he did not, for he managed somehow or another to walk right through them unseen. Coming back. though he was spotted and, very naturally, taken for a Hun. The listening post started to loose off at him, as they could get no answer to their challenge, and he, thinking that he had been ambushed, started to reply with his revolver. Between them they must have expended between fifty and a hundred cartridges before our young hero was hit in the arm. He then beat a hasty retreat, and burst into the west end of the trench with his story of an ambush at the same time that the listening post crawled over the parapet at the east end, raising the alarm and, declaring that they had driven back a. strong enemy reconnoitering party with heavy loss. Later.- I've been hit, Phyllis, and am feeling a regular wounded 'ero. I was, walking the trench when there was a bang, and I was thrown forward, on to my face. "You're hit, sir, hit in the back," said one of my men, and with a breathless haste my tunic and shirt was torn off to disclose a shrapnel ball clinging lovingly to my spine in the midst of a huge bruise. The skin had just been scratched. Oh, I was sick... I had fully expected a nice cushy one, and a month down the line, with perhaps a fortnight's sick leave in England to top up with, and then to find it was the merest scratch. Oh, it was cruel. However, the news got round, and I had a message from battalion HQ asking whether they should send along a stretcher? And when I went down to the dressing station to get some iodine put on the wound the M.O. turned round to the orderly and said, "Just put some iodine on this officer's wound will you. You'll find it if you look long enough." That put the lid on it. No more wounds for me. This is a great life, Phyllis, if it wasn't for the death. We have been in our first show, and for the last twenty. four hours have been shaking hands with ourselves at still being in the land of the living. I had a good look at myself this morning in my steel pocket mirror, but failed to discover any grey hairs or fresh furrows of care across my forehead. That wasn't surprising, though, as the mirror has become so rusty that it takes some time to find out what part of your face is being reflected in it. You will probably have read by now that our line was advanced along the Menin Road on a front of so much and to a depth of so much. Our battalion was not in the charge, but was holding the trenches from which it was made. It was just as well, as the men could hardly be described as in the best of health after twenty-three days in the front line without a really healthy drink all the time. (The water that comes up to us every night is a sickly brown, doped with chlorate of lime to kill the weaker microbes.) Anyhow we got it in the neck a bit, as the Germans shelled us hard the whole time the show was going on, and one company had to go up and consolidate the captured line, and lost a lot on the way up. The attack was made at dawn and was heralded by the first real bombardment put up by our guns. For half an hour the shells were just tumbling over each other in a wild rush to get to the German trenches and then one of the other brigades in the division went over the top. As they went our men stood on the parapet and cheered them on. It was a great sight, and you quite forgot to notice that the shells were falling around you too. An eight-inch crump descended on our trench and hit the parapet, covering the veteran of the platoon with earth, but failing to explode. Which was just as well for all concerned, as an eight-inch crump is no laughing matter. - The veteran picked himself up and indulged in a selection from those expressions so dear to the heart of the "old soldier." When he had finished his face lit up in a grin. "Eh, but I cud dee wi' a seat fine," and he sat himself down calmly on the dud and went on looking at the attacking line, which we could just see clambering into the first line of German trenches. A few minutes later as we were all talking excitedly in our trench, one of the sentries cried out, "Here come the Germans," and when I jumped up on to the fire step to have a look there they were, advancing in mass towards us. By now all the men were manning the parapet waiting for the order to fire, which I was keeping back until the Huns were right up.to the wire. Suddenly I noticed something about them. They were unarmed. Then it struck me that they must be prisoners, but there was no sign of any guard. Down the road they came in fours running to beat the wind, evidently wanting to get away from the nasty war as soon as possible. At least a hundred yards behind them came their guard, one man in full equipment with, a rifle on which was fixed a red-tipped. bayonet. On his head a German helmet. Weighed down by his arms and booty he was utterly unable to keep up with his charges and as he passed us was steadily losing ground. You should have heard him puffing by, anathematising breathlessly the over-eagerness of his flock. We sank into the bottom of the trench and shook with laughter for five minutes. I don't mind if I never see a more amusing sight. One of the men as he passed waved his hand to us and shouted in English, "Back to goot old Lunton." All the wounded came back through our trench. It would have been rather a ghastly sight had it not been for the delight which showed plainly on the faces of most of the men to be going home to Blighty. All of them were tremendously excited; this man wanted to show you just how he killed two fleeing Teutons with one jab; that man couldn't stop talking of the hot coffee they had. found up in the German lines. Quite a thousand passed through during the day. K.'s [Kitchener's New] Army put in an appearance for the first time that afternoon. We lost about a hundred men during the show, which lasted till night, so altogether we have lost getting on for half our men since we came up here. It looks as if they must relieve us soon. This is our twenty-fifth day in, and as you can see I've' been reduced to writing to you on pink message forms. P.S.- Excuse. the finger-marks, but I haven't had a real wash for eleven days, or a bath for fifty-five. Isn't it a terrible war? At last, after the twenty-six longest days in the world we have been relieved. Our relief belonged to the newly out "Great citizen army," which, from reading the papers of the last.four months, we had begun to believe to be a collection of supermen. But they aren't, they're just ordinary people. It came as a bit of a disappointment though, to find that they, like ourselves, felt tired at the end of a ten-mile march along dusty roads, wearing full equipment, and it was still disheartening to learn that our machine gunners, despised Terriers, were to stay in a few days longer to stiffen the line. However, we got away, which was the main thing. We are bivouacked in a field, a few tents for the officers and two blankets between four men for bivvies. It isn't much cover, but it's not so bad while the weather is good. We've got a gramophone, and we're quite near a little village where you can get champagne at 3 francs 50 a time. So we're all right. The gramophone was smashed to bits on the way out, and you are sick if you drink the champagne. But we're all right. The men have seized the opportunity of being near a village to go and buy post cards to send home. A few of them go in for pictures of Ypres after the second bombardment, or the square at Poperinghe, or some other equally enthralling view. These they may send home on condition that the name of the place is deleted. To delete is apparently short for "To place one very light pencil mark through" to judge from some of the efforts at deletion. As usual, though, it is the fault of one of the great tribe of Brass Hats. If he had omitted the word delete in his lengthy circular upon the subject and substituted "scratch out", all would have been well, but you can't very punish a man for not understanding his own language. The following story is guaranteed true by my platoon sergeant. I have known more truthful men than he is apt to be when fact look like spoiling fiction. Up in the trenches there was,me spot only about fifteen yards, from the Hun, and here some of the leading humorists of the platoon used to forgather of a morning to indulge in badinage with similarly minded Huns across the way. One day the sanitary man -- a very witty fellow I am led to believe -- had a brain wave. After a certain amount of wordy warfare he adopted a more serious tone, and informed the Germans that they must behave well on the morrow as certain members of the Coalition Cabinet were to make a tour of the trenches. Next day the humorists proceeded along the trench bearing on the end of a variegated selection of headgear boned from Ypres, top-hats, bowlers, and the more humble felt hat. As they went they hurrahed loudly, with the intention of making the Hun think that the Ministers were being shown round. To their disappointment nothing happened. They had expected, at the very least showers of bombs (some people have a remarkable sense of humour), shells, and perhaps with luck the "Hymn of Hate." But nothing happened. After the demonstrations were over the incensed sanitary man got into communication with his friends the enemy and asked them if they hadn't noticed the Cabinet going round. Yes, they had spotted the line of hats bobbing along, and had heard the resounding cheers. Why then hadn't they done anything ? The reply was crushing. "Why for should've our best friends to kill want?" As I have said, my sergeant's information is not always reliable. Also he is a confirmed reader of John Bull and of the "Paper which foretold the war," and doesn't love Asquith and Co. At any rate I never heard the cheering, and I very much doubt if the, Germans could understand the remarks of the sanitary man, who hails from one of the remotest islands in the Hebrides and speaks a language of his own. I shall have to stop now as battalion mess is in five minutes. We still feed together whenever possible, though there was a distinct movement in favour of company messes the other night after the newly appointed mess sergeant, a balloon vendor in peace time, had smothered the macaroni cheese with sugar. P.S.- There is some word of leave starting soon. Just back from our second show. We went up on the evening of the 18th, knowing nothing of what was in store for us, and twenty-four hours later were into as uncomfortable a spot as could be found anywhere upon this earth. About 4 o'clock on the 18th I was turning in for my first nap since the morning of the day before when an orderly came along to tell me that I was wanted at HQ. There I obtained the pleasant information that the battalion on the left were to attack at dusk, and occupy a large crater that was to be substituted for a German strong point, with the aid of two tons of explosives and to the detriment of its Hunnish garrison. My bombers were to create as much of a diversion as possible with rifle grenades, trench mortars, and other forms of frightfulness. So instead of any sleep I had to go up to the posts again and get ready our performance. At one point our trenches approached very close to the enemy's, and here we put our trench mortar. Along the rest of the front line were bombers with rifle grenades, waiting for the mine to go up. At seven o'clock exactly there was a terrific crash. The trench rocked to and fro and seemed to be on the point of falling in. Away on the top of the ridge, five hundred yards to our left, the whole earth seemed to rise in the shape of a big bell, black with great spurts of flame running through it. Then as the earth subsided, and while we were listening to catch the first sounds of the falling debris, our guns opened out, several hundred of them in a few seconds. We had never seen anything like it before, so intense was the bombardment and so confined were its limits, As the guns opened fire my trench Mortar came into action. Up, up, it went through the trees, and down with a thud into the German trench opposite. With a contemptible little pop it exploded, at least it sounded contemptible amidst all the thunder of the guns. We went on firing for another hour or so, and occasionally had the luck to secure a direct hit. A message came through that we had won the position, and soon after, as everything seemed quiet, I retired to my dugout in the hope of snatching an hour's rest, but to no purpose as almost at once an orderly came panting with a message that all bombs, and bombers were wanted on the left at once as the bombs were running out and the bombers who took part in the attack had mostly become casualties. Off I went again, and in half an hour my sergeant was way with eight men, and as many bombs as they could carry An hour later the rest of them were ready, and oft we went, leaving our own trenches bomb and bomberless. It was a nice sensation, going up to that crater, something like walking in your own funeral procession. When we reached it, after passing through a deadly sort of barrage with amazing luck, the crater was an awful sight. By the light of the moon you could see it all, the great yawning hole. a good. fifty feet deep, with dead bodies stretched in ghastly attitudes down its steep sides. Every now and then one of the bodies, stirred by some explosion, would turn over and roll to the bottom, sliding down into a perfect shambles, where it would soon lose its identity among the jumbled heap of corpses and shattered limbs. Around the lip of the crater our men were trying to dig themselves in, but the earth was no firmer than sand, and in a second the crumbling foundations of an hour's desperate work would slide to the bottom, where at least they helped to cover up the awfulness which the first light of dawn was beginning to show up still more clearly. At one or two points, where old trenches led up to the crater, heavy bombing was going on, and it was only with the greatest difficulty that the enemy was being kept back. Our job was not in the crater just then and so we clambered over the lip and into another bit of trench which had been captured by us. When we arrived, the first sight that. met us was. my bombing sergeant, lying dead on the top of the parapet. He had thrown all the bombs that he and his men had brought up, and then, when they had run out, and no more were to be had, he had climbed up onto the parapet and, in full sight of the German second line eighty yards away. had fired at their bombing parties as they tried to work up the front line trench towards them. He had kept them off like this for twenty minutes, standing up there amidst an ever-growing hail of bullets. Then he fell, shot through the heart. But his work had been done. Either he had caused so many casualties among the enemy's bombers that they were unable to come on or else he had scared them so badly that they dared not. Anyhow they did not, and our arrival with several hundred more bombs came just in time. But for him it would have been too late. We buried him that evening, but by next morning all signs of his grave had disappeared as the result of the bombardment to which we were subjected all that night. And it was a bombardment too. Every German gun for miles around seemed to be trying to hit the same spot, the spot on which I was standing too. They evidently meant to attack us, but our guns also got going, and so accurately that nothing could have lived along the battered bit of trench between the Germans and us. Luckily the Hun had over-estimated the range by a dozen yards or so, and when daylight came it found us still there, but the ground just behind us torn up and torn up again by the unending tornado of shells. We were relieved after two days of it, and returned to the trenches in the wood, which seemed a second heaven after that awful crater. Next day the battalion was received, once more by the Kitchener's people, and we reached camp with the milkman, very weary but rather pleased with ourselves. 'Look, there goes poor old Billy's head'. Who do you think we've had here to-day? Ssssssh. And why did he come? Ssssssh. And what did he say? Ssssssh. "Word came back that you had fallen into a shell hole and been drowned, so of course I came up to take command," which I imagine was their way of letting me know that they had heard of my soaking in the pond the other night. By this time there were no more worlds to conquer as we had come to the end of the trenches, so I gathered my flock around me, let them sit down and smoke, and started to lecture them on "The origin of bombs and how they first came to be used in trench warfare." Before long a gentle droning sound rose from them, the heat and my voice had done the trick. Together we slept. At noon I roused them and did a little close-order drill which was not their strong point. Then we marched home singing, and fed. In the afternoon we threw live bombs. Not a very strenuous sort of day, was it? But there seems just a chance that the end of the week will find them with plenty of work on their hands. If it does, so much the better. We're getting fed up with the waiting. Here's to the day! Here we are back again on the scene of the attack of the 25th. And what a poor washed-out remnant we are now one company - eighty strong consists of the remnants of B, C, and D Companies, under the guidance of the signalling sergeant. The bombers are about thirty strong, but they include many recruits from the companies. Since the show, we have been so hard up for them that instead of giving a long training to the would-be anarchists we pick out likely looking men from the companies, draw them.up in line, and tell them that they are bombers. And bombers they have to become forthwith. We have been having a perfectly ghastly time this last fortnight. After we got back to camp from the show there were rumours of a month's rest. We rejoiced, forgetting that last time that that rumour raised its grisly head, we did almost a month running in the front line. It looks as if history was going to repeat itself this time, as we are now in our thirteenth day. On the night after the 25th we went off to bed pretty early, as we weren't feeling very fit. It must have been just about nine o'clock when we blew out the candle, and hardly had we done so before a terrific bombardo started. We looked out of the door of the hut and saw that it was coming from the old place. Louder and louder it grew, and we looked at each other in dismay, for we thought that we should be turned out of bed and sent up. For half an hour we lay and listened, trying to detect the hum of a motor-bike from out the roar of the guns. Suddenly the expected sound came, and I for one lay shivering, waiting for some one to dash in and tell us to get ready to move. The door flung open, and there stood a dispatch rider. "Bombing Officer here?" he cried in a loud voice. Evidently the bombers were wanted up there. My heart sank still further into my boots, but I just managed to answer that I was. "Urgent message for you, sir." and he handed me a pink slip. With trembling hands I lit a candle and unfolded the paper. At that moment I would have exchanged places with anybody in the world. But as I read there came to me a great sensation of relief. "Detail at once," ran the chit, "two bombers to attend the Divisional Grenade School". We aren't heroes exactly, are we ? In the morning we heard the explanation of the trouble, and it goes to show you how high-strung and panicky both sides become after a few days of fighting like this. Two men of an English regiment had gone out over the parapet to bring in a wounded man who could be heard crying for help outside. By the light of a flare the Germans had seen figures approaching their trench and taking alarm they had started to hurl salvos of grenades out into their own wire. The men in our trenches, being a bit windy and hearing the awful din, thought the Hun was attacking, and started off rapid fire although if they had thought about it a bit they would have realised that people who were bombing their own wire couldn't he attacking. This persuaded the Hun that we were on the way over (through our own rapid fire, mark you), and he sent out the S.O.S. to his artillery. Our artillery took the hint -from theirs and in a minute a first-class attack was going on without anybody wanting to attack. It took almost an hour to find out that the whole thing was a gigantic "wind up". At the time that, the bombardment started, our transport had just arrived behind the supports, and rations were being off loaded. Thinking that the Hun was upon them, the transport turned tail and galloped off at full tilt, as was only right for them to do. It would have been stupid for to stay. and get captured with all their horses and limbers. At the same time the German transport was also close to their trenches, deeming discretion the better part of valour, made a bee-line for distant Roulers. The men who were in the trenches at the time say that they heard the noise of the retreating transport above the roar of the guns, and I can well believe it, as in the ordinary way, coming up at a walk you can often hear the German rations being brought up to some spot or another behind their trenches. The next alarm wasn't a false one. It came at 3.30 in the morning, the first winter morning of the year. The adjutant rushed in and told us we had to be off in half an hour, and as the guns were going hard in the same old place we didn't need to be told where we were bound. Cold, cheerless, and breakfastless, we started off, and surely the pipes have never sounded more mournful than they did as we plodded on through the slush, getting wetter every moment. just out of Ypres we halted and lay down in a field to wait for bombs. The Germans were shelling our batteries near the moat, and as the shells exploded in it great columns of water rose high above the trees, glistening in the sun, which at that moment started to shine through the clouds. At any other time this would have been a sight worth watching, but we felt too miserable. After an hour of waiting, our travelling kitchens came up with steaming tea and bacon, and we were soon feeling fitter. Hardly had we finished than the bombs arrived, and every man was given twenty to take up with him, in addition to the whole of his worldly goods. Then came a four mile cross-country trek, sometimes with communication trenches knee-deep in mud to help (?) you along, and sometimes across the open. Meanwhile Fritz was having no end of a good time shelling us, directed by an accursed sausage up in the air which could spot our every movement.' Ooo! It is a cheerful feeling to hear a shell falling, falling, falling, always nearer to you, and to know that you are stuck fast in the mud. and carrying enough explosives on your back to blow up the House of Lords. We arrived about three in the afternoon, absolutely done up, to find that we were just too late to take part in a counter attack on a part of our old position, which the Hun had mined. However, we had to get back as fast as we could to the village of the church with the organ, and find what cover we could there, which was none, while the bombardment and the counter barrages were on. At dusk we were called out again to do another counter attack, but before we got to the trenches it was countermanded and we were sent to chew the cud in a very wet and cold communication trench. About midnight we heard our fate, which was to go up to the wood in support. A guide came along to take us to the dug-outs. Guides are of two kinds - those who admit that they don't know the way, and those who don't admit it. Ours was the latter class. As he had ascended rapidly in the mine earlier on in the day you couldn't expect him to be very bright, in fact it was a tribute to the hardness of his head that he was still alive. He led us over all the wettest places, through the thickest brushwood, among the most formidable of our support line wire entanglements, over the widest and slipperiest trenches, and finally turned round and asked me which way I thought we ought to go now. If I had still had enough energy I am sure that I would have killed him. It would have been for the best. Eventually we arrived at the dugouts and found that the bombardment of the last few days had reduced them to ruins, which had been rendered more picturesque, but less desirable, by several inches of water. None of us slept that night, we were too tired. We just lay and felt the water in our boots turning into ice. Next day we relieve poor chaps who had had it so badly in the neck. Our regimental motto is " Die Hard," but they've been finding it pretty easy just lately. So here we a Noble Band no doubt, but most of us with flue or worse. I've never seen a more done up looking lot, and I never want to. Please note change in address. I am on the brigade Staff and have hot water to wash in. Yesterday came the news that I was indispensable to the higher command. In other words I was the only bombing officer left in the brigade, and they wanted some one to do that sort of thing. Hence proposition, as we used to say. When the wire came I sank down in a swoon. In the words of Sydney Carton, 'This is a far better rest that I go to than I have ever known,' I gasped, but I wasn't right, as there seems to be quite a lot of work to do. It appears that you do work on the Staff after all. Of course it isn't considered correct to be caught out working, and that is why, when you enter the brigade office, you may find the brigade major peppering the Staff captain with paper balls. It's only done so that you may think that they don't work. If it was once discovered that the Staff worked as hard as other people, the chief grouse of the British Army would be taken away, and it is well known that the British Army without a grouse would be as heartbroken as an A.S.C. (Motor Transport) officer without spurs. The message said that I was to report to the brigadier at 8 a.m. Therefore at 8 a.m. exactly I knocked at the door of his dug-out. I don't think I should have taken the message so literally, as after a pause the door opened a few inches and portions of the general appeared, clad in an eye-glass and a selection of intimate underclothing of a woolly character. He looked at me as if I had come for the rent, and so I disappeared. Isn't it a terrible war ? My dug-out here is of the very selectest. A 4.5 inch crump landed on top of it yesterday and exploded, but nothing untoward happened. In fact it is rather enjoyable to hear the shells pattering on your roof. It reminds one of home in April. P.S.-They don't allow me red tabs, which is a cruel shame, as leave ought to be along again soon. Here are we once more upon French soil, bless it. Enough of Belgium for many a day. "Soon, soon, to faithful warriors comes a rest," as the hymn says, which means that after a year of trial and tribulation our poor old emaciated division, consolidation contractors, frightfulness frustrators, salient saviours, etc., etc., has been pulled out for a rest, though some say that we are only out for a day or two on our way down to Loos, and, others, more daring still, prophesy Mesopotamia at an early date. However, I 'opes not, as we are very comfy here. On fine days I ride round and see the people with whom I have business, and on wet days I wire for them to come and see me. This is the life. I am billeted in a wine shop, and have a nice bed with white sheets. The only crab is that in these parts the bed-clothing consists of sheets and a duvet, an enormous sort of pillow which takes the place of blankets, counterpane and all. The result is that after you get into bed you are beautifully warm for a short time, but then you fall asleep and move about a quarter of an inch, whereupon off slides the duvet, and you wake up a block of ice. The old gentleman who keeps the place means well, but his idea of French and mine vary considerably. Thus when tried to get a second latchkey for the use of my servant he was completely nonplussed for some time, bit it eventually dawned upon him that I was not an "officier" after all but my own servant, which wasn't quite what I started out to. prove. No, I am not a brigade major. Our mess is in the gas works, and we are waited on by a fair young thing who is much enamoured by my kilt. While she waits she beguiles us with stories of the officers who have been billeted on them before us. Of one, a. Canadian, she was especially proud. A cinema has been started in one of the barns here, and we are going to see Charlie Chaplin, who seems to be all the rage now, so I shall have to stop. The Gas Works, November 10th 1915. Our rest continues satisfactorily, and despite all sorts of wild rumours we look as if we are here for several weeks. But don't get into your head that a rest, as understood by the Army is the same thing as a rest cure. It is a period spent in feverish activity, trying to get people to look like soldiers again. Of course it's very nice to be well out of the way of Skinny Liz, the eight-point two, and Silent Sue, the naval gun, but the further away from them you get the nearer do you approach to the home of the Red- Hats, and if you allow the men two minutes real repose along comes some old fellow and asks you why the ahem, ahem, you think that you have been withdrawn to the training area. We went to see Charlie Chaplin and were much entertained, although the machine did break down for half an hour or so. At the back was a Major-General complete with red-tabbed following. In between, every sort of soldier, loud-voiced Cockney and stolid farm hand from Suffolk, brawny Highlander and, wiry lowland Scot, gunner and.A.S.C. driver, sapper and trooper, with every here and there a leather-capped Australian M.T. man and steel-helmeted, blue-clad Poilu. And when Charles, with his usual deadly aim, registered a direct hit with a brick upon the face of the policeman, who laughed most, the, major-general or the bugler boy in the second row? And when the light failed and the pianist struck up popular tunes, was that the voice of his chief of staff which; you could hear among the rest singing, " Hullo, hullo, and who's your. lady friend ? " or was it just my imagination? You've no idea what a busy life generals have to live out here. I am seeing a bit of it now, and you can, take it from me that they are up and about as much as any man under them. From dawn to midnight one thing or another has to be done, and in the trenches, when they are round some part of their line every day, no rest is theirs. Some generals, though, don't agree with constant paddling round the firing line, which they say is not the proper place for them. Perhaps they're right, but the British working man, Tommy I mean, dearly loves to have his own little bit of gold braid round to see him, and the further forward the more he likes it. Did you hear of John's engagement? It's the people who are getting that way now, isn't it? Why, he's no older than I am, and she's younger still. What fools these mortals be. You don't find me succumbing to anybody before the end of the war. The Staff captain has just told me that I'm for leave the day after to-morrow, so look out for me in a few days.-T. The Gas Works November 21st. We had rather a rotten journey again, as it was very cold and several things went wrong. When we did get in, about 11 p.m., we found that there was no train for us, as of course it had started from Boulogne hours ago, and had long since passed through Calais. We were told that the next one would soon arrive, and so we waited on the bleak platform and saw the dawn before we did get off. At railhead we found a bus waiting to take us, here, but it had been standing still for most of the night and like ourselves was suffering from a cold inside. The engine wouldn't start, and so we had to push it down hill for a good hundred yards before faint gurglings, from the bonnet gave promise of better things to come. On the drive home I felt very drowsy, and fell into a doze, from which I wakened in the act of putting my arm round the waist of my next door neighbour; the colonel of a pioneer battalion. I suppose that it was the purr of the engine awakening in me the habits of the past week. More than ever, Your Thomas. BACK IN BELGIUM, November 30th, 1915. Once more we "are in the midst of foes," and still in the Salient, bad cess to it. But we are further down this time and in what should prove a more peaceful spot. We are sharing trenches and rest camps with another brigade, and at present we are out and they are in. Brigade headquarters are four huts in a sea of mud, and the battalions and also imbedded more or less firmly in the same mixture. Our mess is a small hut raised several feet off the mud by stakes. The rain. comes in through the roof, and the wind enters by way of the floor, the windows, and the stove-pipe. Apart from this it is a nice room, and the last occupants have left us two copies of La Vie Parisienne and a sheaf of War Cry's, the official journal of the Salvation Army. The bedroom suite is some way off. and across an almost impassable road. Here we each have our own little cubicle; and the walls are papered with strips of red and blue stuff spangled with golden stars. The whole edifice nearly went West last night when one of the servants lit such a fire in the improvised stove that the tin chimney became red-hot and set one of the walls on fire. Luckily it was raining. so hard that the fire soon went out, but there is a large hole burnt in the wall and many draughts enter therein when you are dressing. The terrors of war don't seem to be properly under stood by the people in the trenches, but further down the line they - well, this is what an R.A.M.C man told me. One day business took him thirty odd miles into the back of the front, where he found himself in a stronghold of one of the non-combatant corps of the army - their name is legion. Talking to one of the temporary inhabitants he was unwise enough to remark that they seemed to have a nice safe spot to live in. Immense indignation and a half-mile walk, until a small hole in the ground was reached. 'That's where we were bombed last June.' So perhaps, we aren't the only people to run awful risks. The frozen roads of yesterday are the quagmires of to-day, and where. last night, three lorries passed each in comfort, one now tarries, mudded in up to the axles. In this war General Mud plays the part which used to be ascribed to General Janvier. You can't have any idea what it's like in the trenches, one moment everything fairly dry, the men cheerful, and the prospect of winning the war by 1920 quite in the picture. Then the rain starts, and from under their waterproofs the men look out at you as miserable as a collection of drowning rats, their feet splashing about in watery mud. At the back of every man's mind is the certain knowledge that he has no dug-out, that it is too wet to light a fire, and that the war will never end. As the rain trickles down their necks they wonder why they are paid a shilling a day for doing nothing. After all, they can't be a sixth part as valuable as the motor transport driver, back in his cosy, billet trying to spend his six shillings a day. Not that life is roses, roses all the way for them either, in fact there are very few people out here for pleasure, but it does strike the poor old foot soldier sometimes that it is funny that the further.down the line you get the more you get paid for being there. And it's jolly hard to believe in the honour and glory of sitting still in a stinking ditch gathering unto yourself many years of rheumatism in the future. We have started a divisional concert party now, the Woolly Bears they call themselves, after a particularly noxious type of Hun shell. There will be moments of heart-searching for some people thirty or forty years hence. Imagine, for instance, the feelings of X, when his grandson, from his perch on grandpa's knee, asks the fatal question, "And what did you do in the gweat war, gwanpaw?" Will X. tell tales of derring do, or will he admit that he was the brunette of the -th Division Wind Ups? And will Y. in his dotage roll up his sleeve to show the scar, and tell tales of Loos? Or will he button it up and try and forget that he cut his arm while operating the cinema lantern ? Will Z. glow with pride when he remembers how he used to wash the socks at the Divisional baths, and will Mrs. Q. ever know that her husband's, Captain Q. 's, experience of war was conducting nurses round the trenches at the training camp? I asks yer. A Railway Carriage, somewhere in France, December 12th 1915. Weep with me, for I am in the toils of the great red tape machine and am gradually freezing to death in this carriage as it crawls on its tired way to Rouen. From Paris Plage I was pushed off to �taples, where I was left to languish for a whole day for no apparent reason except that I was newly out of hospital and very liable to catch pneumonia in the tent wherein I lay. This morning I left for the Front in charge of a draft, and laden with Movement Orders, Nominal Rolls, and similar piles of waste paper. When I say left for the Front, what I really mean is, set off in a direction as nearly opposite to the right one as possible, and am now on a short tout of France in a refrigerator. Thus to get to Belgium I have to go down to Rouen, and,from there back through my starting-point to the front. The only useful purpose I can be performing is to air this terrible carriage, and surely that is a work that women and children could do just as well. As you may gather, I am not in a very good temper, and so I suppose I had better leave off until such time as a fire and a good meal have cheered me up. Think I've recovered sufficiently from my fit of depression to carry on. I have now settled down for good at the Base Detail Camp, at least it doesn't seem as if they are ever going to let me away. Here we rise and have breakfast in time to get on parade at nine. On the first day I strolled on gaily, little knowing what was awaiting me. There were about half a dozen of us officers and eleven hundred men, drafts to about twenty different battalions, drawn up in mass. After the usual preliminaries the adjutant of the camp turned round and asked which of us was senior. It seemed that I was. Would I then be good enough to march the battalion down to the central training ground. Think of it, and I hardly able to remember the right moment to say "Number 14 platoon, by the right, quick march." I had no more idea of what to do with a battalion than a mackerel would with a pair of water-wings, but it seemed to be a fairly safe thing to do to call them to attention. "So, 'Battalion - Shun'. No one seemed to pay any attention. "'It's not a secret," remarked the adjutant bitingly, try and whisper it a bit more loudly.' This time, I fairly shrieked it out, 'BATALYUN - SHUN.' They shunned. Made bold by my success, 1 tried another move, 'SLOWUP - ARRMS.' About half of them did and the other half didn't. They just stood there and grinned. 'Can't you see that half the men belong to rifle regiments ? ' from the adjutant. 'Er-m-yes.' This was very interesting, but hardly a time for small chat about the men's units. 'Don't you know that they don't slope arms?' 'Can't they?' 'No rifle regiment does.' 'Oh,' said I, 'Then tell me how I ought to talk to them.' He did, and we moved off, me at the head. The training ground is a large sandy plain. skirted on two sides by a pine forest which stretches away for miles and miles. Here. while the men go through a rigorous course of training, officers can attend a lecture on trench warfare, throw live bombs, or be instructed in the machine gun. I have heard, and seen, all that I ever want to of trenches, and I'm not keen on throwing bombs under the guidance of a man whose only claim to be teaching the subject is he isn't well enough to be up the line. Therefore I have been a regular attendant at the machine gun lectures and know already that the lever on the Maxim gun pulls forward, while that on the Vickers pulls back, or vice versa, I never can remember quite which. The town isn't half such a bad spot, and much amusement and good food can be obtained therein. Last night we went to see a revue, but it was disappointingly proper. Have to censor about seven hundred letters now. How these men do write when they come out first. THE CHATEAU, December 23rd. 1915. Back to the front, and rather glad to be there, too, strange though it may seem. just in time for Christmas in the trenches, and fatigue parties are out trying to find holly and other seasonable greens for the walls of the chateau. It hasn't changed much, the old shatoo, since my late departure, only a bit more dingy outside and a bit more musty in. Did I ever tell you that I am Mess President? Though I says it as shouldn't, anyone less fitted for the job could hardly be imagined, with the exception of my predecessor, the late French interpreter. He had spent many years in Patagonia or Pamphylia or one of those outlandish spots, and had lived there entirely on sardines and raw mutton, until he had grown to have a devouring passion for them and for nothing else in the world. However his King and country, or the French equivalent, needed him, and he departed for the less healthy atmosphere of a trench mortar battery, where his days are numbered, poor fellow. The result is that if I dare to present VILLACA delicacies to my patrons there is a row. At present my chief trouble is the Christmas dinner. The plum pudding is all right, except that it will be hard to choose from the selection of them which is pouring in every day. The general has two, the brigade three, the Staff captain one, and the rest of us five between us. How I am going to make them all imagine that they are eating one of their own I don't know unless I take a desperate plunge and use the pound one sent by the Daily News. It should be a pleasing sight, half a dozen stalwart Tariff Reformers eating the gift of that paper. After the pudding we have plenty of preserved fruits, as well as almonds and raisins, but the turkey looks like falling through and heaven alone knows what will take its place. There is a large haggis, but of course that is being kept for Hogmanay night, I'd love to give them mutton with sardines as the savoury, but I don't think I have the courage. We shall do all right in the liquid department, as we have been sent a dozen of champagne and have some fine old port (� la Field Force Canteen) and a selection of liqueurs in our cellar. Our cellar, by the way, is a large packing-case which travels with us wherever we go. Each time we move, a bottle of port or whisky gets smashed �"must have been the bumping on the road"-- but it wouldn't look so suspicious if one of the bottles of mineral was done in as well. Isn't it a terrible war? We have two orderlies to do the waiting and that sort of thing. It sounds rather extravagant, but it isn't really, as one of them is too old to do anything else, and if we didn't have him he would have to go home as unfit. The head orderly stutters, but never smiles, and is constantly fighting with his helpmate, the infirm one, who goes by the name of Gibb. Gibb is a canny Scot, tall and skinny, with a flowing white moustache. He is very old, and claims to have fought in the Crimea, or one of those little shows of the early nineteenth century. He loves any sort of work which is unnecessary, and, though he is always at it, he won't do anything unless he does it in his own way. His chief jobs are to pick the tea-leaves out of the sugar (somebody down the line always mixes them up before we get them), and to remove the hairs from the crust of the bread. Ration bread is always covered in hair, for some reason or another. It rather looks as if the bakers rub the loaves in sandbags while they are still warm. He does those two jobs quite well, but where he is a bit of a trial is waiting at mess. Of course he is much older than any of us, including the general, but that is hardly a good reason for his taking part in the conversation as he hands round the soup. "My opinion," remarks our guest, a mere major-general, is that the Germans are not yet nearly done for, and that -". "Mon," breaks in old Gibb, "d'ye no' ken whit yon Bottomley says? " and the major-general, unaccustomed to being addressed as "Mon" by a private soldier, collapses in his chair unable to speak or eat. The journey from Rouen was uneventful, arrived at the camp of the draft I had been bringing up at about midnight. One of the men to whom I was talking complained of the quietness of everything. He thought that there should be more noise and excitement generally. I told him that he we get all the excitement he wanted soon enough. And he did. Hardly could they have got to sleep before a most horrible shindig started, and soon every gun for miles around was going hard. I had just reached the shatoo and was relating my experiences of the past fortnight when we suddenly noticed a sweet smell, but not so sweet that we wanted to go on smelling it indefinitely for it was gas. Then we understood what all the trouble was. Our front was all right and couldn't feel any of the effects of it, but where we were, a mile or two back it was quite strong blowing down, as we afterwards learned, from the direction of Hooge. Altogether it about the biggest fiasco possible for old Fritz, because all that happened was that his brave infantry waiting to walk into Ypres found themselves being rapidly interred in their own trenches by our artillery, and the few who did try to get up and try to advance soon wilted away into corpses, which, of course was all for the best. Well, old thing, keep the Yule log burning, and have a good Christmas. We mean to, though there's going to be no palling up with the Hun this year. Private Peace and General Good-Will got gassed up at Hooge on the 19th; they hadn't been given tube helmets, you know, but Father Christmas, aided by the RFA, is going to do his bit along the German front line. Such excitement, a German aeroplane brought down in the same field as our huts. We were sitting down to breakfast, when overhead we heard the faint pop-pop-pop of a machine gun and out we rushed. Seven or eight thousand feet up, shining like silver in the morning sun, was a Taube, making all out for home with a great trail of steam shooting from its exhaust, and behind it, but rapidly drawing up, was one of our fighting planes. As we looked, our machine, gathering up a terrific speed, passed over the German, then turned round like lightning and was over it again, and then circled round it, firing all the time. Suddenly the Taube burst into flames and crumpled up. Down, down it fell, faster and faster, and soon we could see that it was coming very near us. With a swsssssssh it came, as we all lay flat and hoped for the best, but it landed a little heap of charred wood and iron a good fifty yards away. We rushed over to see if anything could be done for the pilot, but he was wanting nothing but a quiet burial. Back Poperinghe way we could see the victor volplaning down to his breakfast. We were relieved last night just about the time that rep~ relief complete. And poor old bruised rgiS hobbled off to its permanent rest, billet. The first sign of the relief comes M- the morning, when the signalling, officer of the other brigade arrives, and starts to take over the Unes, and to go over those which have been newly laid. His signallers arrive soon after lunch, and half an hour later outs leave for camp, the first of the brigade to go. During the afternoon the machine gun and bombing officers turn up, either on horseback or else on loot from the corner at which a friendly motor lorry has dropped them. Soon they are poring over maps in which lines in all colours radiate from points where machine guns lie hidden,. and lists of grenades held in the-trenches and at the main stores. Before long their relief is finished and two more weary soldiers hit out for home. With much splashing our mess cart struggles through the mud, loaded high with food and "the cellar." I am rather afraid, too, that when it turns the corner out of sight the packs of all the batmen will be added to the pile. The general, his work done, sits and reads the Times over again, while in the office the brigade major and Staff captain are clearing up their papers and talking. Darkness is falling when, with much creaking, the baggage of the other people arrives, and soon from the direction of the kitchen comes the smell of frying onions. The purr of a motor is heard in the distance, and then the k-lop, k-lop, k-lop of feet being dragged out of the mud. The door opens, letting in a blast of cold air and three muffled figures, the brains of our relief. The two generals retire to their room, where they discuss defence schemes and the programme of work. Our general is thinking to himself that he almost wishes that he hadn't to go because he knows that the other people will thoroughly mess up . the magnificent results of a week of real hard work. Their general, on the contrary, finds first his worst forebodings were only too true, and that during the week he has been away we have done absolutely nothing. That's the way in the army. Nobody ever does any work but oneself, and yet they do so that two million sandbags are used every week. In the office there is an atmosphere of "gum boots, thigh left in trenches" and "position of suspected M.G. emplacements." While the Staff captain is handing over lists of stores, the correctness of which he certifies with his tongue in his cheek, the brigade major is explaining what has happened during the week, what work has been done, what strafing attempted, and, generally speaking, how the war has been progressing. Dinner comes on, and the mess president of the incomers apologises to the brigadier of the outgoers for the poorness of the dinner, which as a matter of fact he knows to be a particularly good one. Just as coffee is being served a message comes in to say that two of the battalions have successfully completed their relief, and gradually other pink slips arrive, telling that one lot of men have sat down to watch for another week and that ours are squelching down the long, long trail home. Ten strikes, and there are still the machine gun company and one of the battalions unrelieved. Our brig. yawns. He has had a long day. Soon we are all yawning. "We have nothing to do, and, are very tired; they want to get to bed and sleep so they can be up early next morning. We both have to stay until that last battalion has finished its relief, for the machine guns reported shortly before eleven, and it is almost twelve now. The brigade major goes to the.telephone and rings up. "Haven't you finished yet - think the party for 32 must have got lost - try and hurry them up - yes I know it's very dark - right - good night - what's that - oh, thank you. Same to you." Then hanging up the receiver and turning to the general. "They aren't quite finished yet, sir, but they wish you a Happy New Year". We settle down again in our chairs and carry on with our yawning. An orderly brings in a pink form. The brigade major wakes up with a start. "That's all now, sir," and goes off to wire to the division. We collect our coats and prepare to leave, when the brigadier remembers a story he must tell. It is a very long one, but all stories have an ending. The door opens, letting out a ray of light into the dark night. Then it closes and we plough our way towards the car, where the driver sits half frozen. Sleet stings our face and ears, and we bury our chins still further in our coats. A mile or so in front of us men will be standing out in it all night. We are the lucky ones without a doubt. And from the cross roads the Belgian battery bursts out into a new year's greeting. Ha-ppy-New-Year. All packed and ready to go to the trenches, but the Staff captain is away and I am doing his job for him, and am going up in the car, so I have a spare half hour in which to write. During this last rest we have been doing a good deal of experimenting with a new bomb thrower, which. on account of its queer appearance, has been christened the Heath Robinson machine. Four men, if they are strong can just carry it, and the same number are required to work it. It stands on a broad base and consists of masses of very powerful springs and slender wooden arms which break on every possible occasion. In fact it combines the weight of a large howitzer with the effectiveness of a pea-shooter and the accuracy of a P.mb.rt.n B.11.ng. [Noel Pemberton-Billing was an eccentric inventor who formed the "Supermarine Air Company' and set about building a flying boat. The aircraft, named the P.B.1, was completed in 1914 and put on display in Olympia, London, but unfortunately it never flew. In 1915 Supermarine then built an unconventional four-winged Zeppelin interceptor named the Nighthawk but this machine was also a failure. This was the same company that was to produce the Spitfire in WW2!] The first time that we tried to use it was very nearly fatal to several of us. We placed the machine in position, in accordance with the book of words, pulled levers, compressed springs, and generally went through the motions until we were perspiring freely. Then with great pride we placed the bomb in the cup and all of us stood aside except the. man who was to light the bomb and depress the firing lever. The bomb lit with a splutter, and the operator depressed the lever. Up soared the bomb, up, and up, and up. Straight up in fact. This wasn't quite what we had intended, as when a thing goes straight up it comes straight down, and we were directly below it. We stood there, stuck in the mud, and watched that brutal little thing go up and up, and then down, down, down, until it fell with a flop into the ground At our feet. We held our breath and waited for the end---only another second now, er--er---p'raps it's a dud. And a dud it was, thank the Lord, or I shouldn't be here to tell the tale. However, it gave us wind up, and we decided to practise with dummies until we were a bit more certain in our aim. After half an hour or so five yards in a hundred, was our greatest error, and so once more we started on live bombs. The first one tore out of the machine at a terrific rate and buried itself several feet deep in the ground about ten yards in front of us. Luckily it was imbedded so deep in, Belgium that the ensuing explosion did us no harm, but there wasn't any great keenness to go on after that, though we had to carry on and give the thing a proper trial. The next shot went off almost at right angles and entered the camp of a grandfathers' battalion, where it slightly wounded one young chap of sixty-two. He was hugely braced, as he said that three of his sons and four of his grandchildren had already been in the roll of honour and he was beginning to feel rather out of it. We stopped for the day. The grandfathers' battalions are, I believe, technically known as labour battalions, and are recruited from men of over forty-two. To see the old dears marching along in what they call fours, dressed in their leather jerkins, with a spade over one shoulder and smoking clay pipes, is one of the most cheering sights of the war. They don't look like soldiers, and don't always address their officers as "Sir," but they stroll along to their work laughing and talking as pleased as Punch,to be "doing their bit out here." And they do their work well too, road-making generally or digging reserve lines of trenches. They don't carry rifles or any unnecessary equipment, for which I should think they were only too thankful, although I did hear one old boy grousing because they sent them up somewhere they were likely to be shelled without rifles! Most people would rather have had a spade I should think. A frantic message came from the division the other day that several hundred old bombs which had been returned to the D.A.C. had been sent with their detonators still in, and as there are about two hundred and thirty-five regulations against this "practice," a Court of Enquiry was to be held to decide who was to blame. On the face of it things looked rather black for me, and so it was with a certain amount of trepidation that I attended the court and heard the evidence becoming more and more incriminating. The decision of the court was that somebody was to blame and that that somebody was me. As a last resort I suggested that we should go and see the bombs, for I was almost certain that I was guiltless. We went to an old barn where we found a guard placed to ward off any inquisitive persons from the danger zone, and amid shivers of excitement we went in and saw before us on the floor a heap of old rusted bombs, the mud of the trenches still thick upon them. "There you see", said the president, "detonators and all," and he pointed to something which protruded from the end of each bomb. This was awful, but in desperation I picked one up and looked at it. Then the laugh was with me, for what had put horror into the division was not a collection of detonators and fuses but some little bits of wood. The bombs were of a very old kind, in which little bits of wood take the place of detonators until they are ready to be fused, and what with the mud and the rust and the antiqueness of them the DA.C. had got wind up quite needlessly. It was to know that I shouldn't be shot at dawn after all. The brigade-major is rather proud of his horse, though as far as I can gather from equine experts it's nothing to write home about. On Wednesday there was a Divisional Horse Show, and he sent up his beast, though he couldn't go himself. In the evening it came back, and he announced to us that it had taken first prize. He went on to say that this proved his contention that it was no end of a charger, when the machine gun officer looked at the prize card. "What did you enter him as?" he asked. "An officer's charger," replied the S.M. indignantly. "Well, I only wanted to know because the card says 'First Prize for Light Draft horses." Then we smiled, but not the B.M. Did you see in the paper a few days ago about the Hun blowing us up by the Canal? I went there last night just to have a look, although it isn't in our brigade sector, but I thought it would be interesting to see, and besides the old battalion was holding the trenches there. So I started off after dinner and had a topping time. You would hardly know the place - of course you wouldn't - I mean I could hardly recognise it, so much had it changed since we were there in August. The trees which I knew as trees are now mere stumps, and the stumps I knew as stumps are now little splinters lying here and there all over the place. Right at the point of the mound there is an enormous crater, far bigger than the Hooge one, and to look down from the top of the mound to the bottom of the crater at its foot is almost a hundred feet. To get to the trenches round the crater you have to go through a long, long tunnel about four feet square right through the centre of the mound, and then you come out not far from the top, so you have to descend by one of the quaintest bits of trench I have ever seen. It drops almost perpendicularly into the trench below down the side of the mound, and as it is in full view of the enemy it has been covered over with brushwood and broken logs and pieces of rotted sandbag, so that it is absolutely hidden. In dry weather you can slide down it into the trench, and in wet weather you can't help doing so. It was wet when I went. Another little trouble is that it is only two foot deep at present, and unless you bend almost double your head breaks through the pseudo-foliage and a German bullet breaks through your head. On my way back I fell into a shell hole head over heels, and came out rather chilly. I distinctly heard the ice crack as I plumped in. Oh, it was horrible walking home with my clothes gradually freezing on me, but I found that by running I could work up enough warmth to keep the ice from actually forming. - It was about 3 a.m when I crawled into bed, such as it is, and it is now eight, and I am waiting for my servant to bring me up some breakfast. Then I hope to be able to get another hour or two's sleep before getting up. So cheero till this afternoon. It was nearly cheero for ever. After breakfast I went to sleep again, according to plan. Some hours later, I can't exactly say when, but it must have been about eleven, I was woken up by a large, lump of shell crashing through the window, and coming to rest with a bang against the wall. I jumped out of bed like lightning and looked out. There in the middle of the garden were six bright new shell holes, and strung out across the field in front was brigade headquarters making at full speed for a dug-out in a field far away from all shells, and where we had an alternative telephone station through which we could keep in communication with our front. I dashed on a coat and a pair of gum boots and joined them scantily dressed. From them I heard that the Hun had been bombarding the surroundings of the chateau for an hour, while I must have been fast asleep. Of course they were not trying to hit us. It was the guns all round us that they were after, but German shells, especially when propelled from their guns by Landsturmers, don't always hit what they are aimed at. We sat there till three o'clock watching our beloved chateau and expecting to see the last of it every minute, but it escaped marvellously, and except for a few scratches took no more harm from it than we did. Oh, but it was cold. If you have thrills to thrill, prepare to thrill them now. The morning broke fine but foggy, and I went forth to war. When I reached the front line the fog had grown still more pea-soupy, with the result that it was possible to go right out in front of the parapet and have a good look at the wire and the night listening posts without danger of being spotted. So out I climbed, for there was one post, on the edge of a small crater, which I was anxious to see by daylight. As the journey was rather an arduous one, and not expecting to meet any of the enemy, I left my revolver and everything behind and strolled out. Every little detail for ten yards or so around was quite clear, but further than that all was lost in the mist. I made for the post and jumped in. After I had made a thorough inspection and seen that the bombs and things were all right, I climbed out on to the top, and was just going to make off for home when to my amazement and dismay I saw two Huns not ten yards away, standing on the opposite lip of the crater. What was I to do, alone and unarmed? They had not seen me, but were apparently intent on a search for souvenirs while they had the chance. I decided to creep away and return with my revolver and a couple of men, but before I had time to move the nearer of the two turned round and saw me. For a second he stood there, looking as if he had seen a ghost. He was tall and fair, and on his head was the usual little red and grey pillbox cap. But what scared me most was that in his hand was a rifle. His comrade, noticing that something was up, looked round too, and I could make out the features of his nasty, dirty little face with its three days' beard. The whole thing can't have taken more than a second, but it was a ghastly one for me. To provide target practice for two Huns at ten yards' range is a poor death. But I was not meant to die. Urged by a common impulse those two Huns dropped their rifles and beat it. Talk about a lucky providence, but I'm going to take a revolver next time. You can imagine, too, that I also ran once I found myself alone, for I knew that those valiant Teutons would raise the alarm directly they got home, and hardly had I clambered back into the front line when a burst of rapid fire broke out along their line. I wonder how those two explained the loss of their rifles. There is some word of our going back for another rest. but it seems early days yet. As was rumoured, a rest was in store for us. We were pulled out of the line without much warning, and here we are in a dear old village resting for all we are worth. We arrived at a station eight or nine miles away, and marched here through the snow, first of all along the level, then through a great black wood as still as death, and then down into this, village, nestling round the church, with the walls of the cottages almost as white as the snow itself, and the most gorgeous red tile roofs. Everything seemed peaceful as we halted in the square and waited to be shown our billets. A perfect rest. Breathless rides through those grand woods. Pleasant afternoons round the fire. Of such things we thought. And there were rumours of a trout stream and a beautiful gamekeeper's daughter - the beautiful daughter of a gamekeeper I mean. Our hopes have been dashed to the ground. We are resting in the manner prescribed by the powers that be, and not in our own way. The result is that we have never been busier in our lives. This is what happens. After many months of red war a division is withdrawn to recuperate at some spot in rear of the line. Officers and men are tired. They need a rest. Very well, they shall have one. And so they leave the guns behind them and seek repose. Now the land into which they come is a pleasant land, and a land where no Hun dwells. His place, however, is taken by the Arch-Hun, an old gentleman with a red band round his hat and nothing to do but to worry poor fatigued soldiermen. Before we have even had one good night's sleep Arch-Hun Number One descends upon us. He earnestly hopes that we shall have a good rest, but we must realise that we are where we are not only for the purpose of resting, but also in order to smarten ourselves up again, and recover from the discipline devastating effects of trench warfare. We salute and promise to do an hour's close order drill every day. As he leaves the room, Arch-Hun Number One collides with Arch-Hun Number Two, who is on his way to impress upon us the need for long route marches for troops who have been unable to move about for the past few months. We give him our word for it that we had intended to have a route march every day, and we pray fervently that the other Arch-Huns have an offensive or something,to keep them busy and leave us in peace. But we pray in vain. Number Three we never saw, but he spoke to us over the phone. He said that he was in command of the training area or something of that sort, and was no end of a general. We did not stand to attention as he couldn't see us, but when he rang off we were committed to an hour's running and rapid marching before breakfast. Arch-Hun Number Four was convinced that Physical Jerks were essential to the, welfare of troops in rest, and Number Five thought that we must have forgotten how to skirmish and wouldn't it be a good thing if we did some every day just to freshen up the memories of the men. Arch-Hun Number Six. was of the old familiar kind, from whom we cannot escape even when we are not resting. He desired the presence of fifty men every day at the Coal dump at B24c85 from eleven to two to unload coaL Arch-Hun Number Seven thought that another little inspection wouldn't do us any harm, and Arch-Hun Number Eight, who should really be classed as Super-Hun Number One, put the lid on it by stating that, as the training which must be put in by us during our rest period was so important for all ranks, leave would he stopped, but that as a special favour one per cent of the strength might be allowed to on a jaunt to Calais for twenty four hours. Aren't 4hey good to us ? So here we are resting hard from about 3.30 a.m. till late in the day. One witty adjutant suggested that in order to save the breath of his pet bugler, Lights Out and Reveille should be blown at the same time as otherwise they couldn't be expected to get through all the work. On the whole we prefer the, common or garden Hun to the Arch ditto. There are wire entanglements in between him and us. Cheero, I must run away and rest at the bombing trenches for a few more hours. We have moved at last, back near the old spot, and are now waiting for the order to go up and take over the recaptured trenches. The show seems to have been a great success, and one of the German prisoners is said to have remarked that as soon as they heard our division was on its way back they knew that the fur would start to fly. And it did "some," as the Canadians on our right would say. Apparently the weather was so bad that the show had to be, put off for a few days, and that was why our sudden move was still more suddenly cancelled. When we did move the weather had changed to a sort of early summer, and I had a most enjoyable journey in the hold of a motor lorry among the blankets, which, thank the Lord, had just come out of the Thresh disinfector, an antiquated sort of cross between a steam boiler and a trouser press into which clothes are placed for the purpose of denuding them of their parasitical population. Our new billet is a pub, out of which we have turned a section of A.S.C., much to their annoyance, but with the express permission of a far higher authority. So that's all right, and they have departed in a flurry of field boots and bad language. We have all been served out with the new shrapnel helmet, and now we look like so many Tweedlees. (It was Tweedledee, wasn't it who fought a battle with a dish cover as helmet?). Anyhow the tin hats are about the limit in ugliness, just like an inverted dish cover or tin basin, and when it comes to wearing them they are about as uncomfortable as they can be. They are all made in one size, presumably what the maker thought was the average size of Tommy's head, but he can't have had much admiration for their brains or he would have made them a trifle larger. Mine would only just balance in a sort of Charlie Chaplin way on my head until I took about half the lining out, and now I can wear it perched well on one side of my head in a manner which makes jealous generals stop and reprove me for trying to look too doggy, but, as I tell them, it can't be done any other way. Everybody looks so entirely different in them that sometimes you want to sit down and shriek with laughter, instead of which you have to stand bolt upright and salute, your inside rocking and all but splitting with pent-up merriment. They are jolly good things nevertheless, and if they had been started earlier would have saved thousands of lives. Later. The order has come, and we are off to take over the trenches, so don't expect to hear from me for some time, as there will be lots to do. The fine weather of the last few days has come to a sudden end, and the snow is falling. You at home can have no idea of all that means to us. After a week which will always live in my memory for the awful suffering which was going on around me, we crawled home last night too, despondent to do anything but fall down and sleep, curled up in our blankets, without even removing our wet clothes. A few little episodes from that time may give you a slight idea of it. We set out for the trenches in a borrowed car. The weather was perfectly awful, and so we expected a good many blocks on the road, but we never imagined that we should arrive later than eight. We eventually arrived at three next morning - walking. When we started it was not four o'clock, but it was nearly dark, overhead masses of lowering grey snow clouds, on either side fields deep in snow, and away in front of us, the road, a slippery ribbon of heart-breaking pav�, and on either side of it mud, mud, mud, unfathomable mud, along this road, through the driving snow, crawled a seemingly orderless herd of men and mules, lorries and limbers. In the centre the pav� was crowded with transport, all going in the same way, towards Ypres. Nothing could have moved in the opposite direction for the pav� was barely wide enough for a single motor lorry. Limbers full of rations, lorries coming up with shells, wagons loaded up with timber, barbed wire, and sandbags, followed each other with hardly a score of inches between the tailboard of one and the steaming nostrils of the mules of the next. And in this funereal procession we had to take our place. Beside us plodded a platoon of infantry, their feet sinking deep into the mud at every step; wet, cold, and altogether miserable. It was bad enough for us in our car. It must have been awful for them. Suddenly, suddenly is a bad word, for we were only travelling at about two miles an hour, the limber in front of us stopped with a jerk. Momentary pauses were common, but after standing still for several minutes I got out of the car to see what had happened. A hundred yards up the road a lorry had side-slipped and was stuck.with its front wheels fast in the mud at the side of the road and the rear several feet out into the middle of the pav�. This made it practically impossible to pass, but an ammunition limber bringing up urgently needed shells, and already very late, decided to chance it, and urging his horses to a canter, the driver dashed straight for it. A few yards from it they swerved, the near wheels sinking deep in the mud as they left the road, but their impetus carried them past, and with another swerve they were on to the pav� again, and trotting off in the distance. We get a bit restive sometimes when we see the Royal Regiment bringing up one officer's kit in a six-horse limber at a trot while we poor infantry have to be content with two mules to draw our heavily loaded wagons at a walk, but if it leads to driving like this you can forgive them. The next limber, loaded up with rations, tried to get past in the same way, but its mules were either not strong enough or not well enough driven, and, the rear half of the limber sticking in the mud, the front half swung across the road, the mules stumbled and fell into the ditch on the right; and there was the whole road blocked. The lorry had to be unloaded before it could be coaxed on to the road again, and while this was done several pairs of mules were untraced from limbers in the rear and were connected up with, the one which had fallen across the road. With much swearing of drivers and creaking of harness the fore part shifted, and then with a sudden rush they tried to pull out the rear half from the mud. For a few yards it ploughed its way along, the wheel scraping against the side of the road, but refusing to come up on to the pav�. Then with a crack the wheel broke. The only thing to do was to off-load the limber and push it into the ditch, where, for all I know, it still lies. The road was now clear and on we went. Soon we caught up the weary infantry and passed them, but when we reached a village where two converging lines of traffic meet we were held up again. And so on. When we did at last reach the cross roads where the transport turns off for the trenches it was nearly eleven o'clock, and the weather was worse. than it had been before. The road was of much the same kind as the one from which we had turned, but narrower and smashed to bits by shell fire. To add to the difficulties, on one side of the road there had once been a light railway, and now the shattered rails threw up their jagged edges out of the mud. Our car plunged headlong into a shell hole and refused to move. Neither backward nor forward could it stir. Some men stumbled towards us from the trenches, falling into holes every few paces and picking themselves out again without complaint, too tired even to swear. Wet through from head to foot, footsore and utterly weary, these were a few of the men who, the day before, had taken part in the most gallant and probably the most successful enterprise of the year, heroes if you like. But not much glory about it for them as they stagger home. Though they were so absolutely done, they offered to help us, and help us they did, but to no purpose. So we left the car and started to walk along the road, or rather along the field by the side of it. The road itself was the wonderful and at the same time one of the most awful sights I have ever seen. Though smaller than the first road we had been on, and though crumpled up by shell fire, it was necessary for two lines of traffic to be on it at the same time. For one limber to move along that road by itself by daylight would have required good driving. For two unending streams to do so in the middle of a dark winter's night with a blizzard blowing was obviously impossible. But it was being done, because it had to be done. And, mind you, one of the two streams had to plough its way through the mud. It was magnificent to see the way in which those drivers dashed through mud over the axles of their heavily loaded limbers. And the way in which their mules responded was magnificent too. Sometimes the foreleg of one of them would crash against a piece of the railway line and with a whinny of dismay the poor animal would collapse in the Mud! There would he a shout for the transport officer. In a few minutes you would see a dim figure leaning over the struggling mule, and then there would follow the crack of a revolver. Soon the stream-would be dashing through the morass again, but this time over the body of a mule. The men in the trenches got their rations. The bombs arrived to fill up the depleted stores. By the light of guttering candles; the holders of the front line read the letters from their wives and sweethearts, crouching together in their low- and damp dug-out.- -And if there were a few dead mules along that ghastly road there were many dead men up on that dread snow-swept, shell-torn Bluff. Three days after the relief a sentry thought he heard a voice out in front of the parapet. At night a patrol went out. Into the mud up to his armpits they found a creature, starving, frost-bitten and speechless. He was taken to the dressing station, where his clothes were taken off and he was wrapped sin a blanket, and placed before the fire. The man who undressed him noticed some peculiarity about his tunic, and scraped the mud off a portion of it. He found that it was grey and not khaki. The man in front of the fire was a German. When he had been given something hot to drink the M.O., who happened to be a fluent speaker of German, questioned him. This was his story. On the day of the attack he with two comrades had hidden in a shell hole with the intention of escaping back to the German lines at night when night came, so vigilant were the sentries on both sides, they dared not, and so they stayed there for another day until, driven by hunger, they had started. The other two had been. slightly ahead of him. As they went the mud became worse and worse, snow and thaw for four days, and after a time they could make no progress. They tried to turn round and get back to the shell hole, but that also they found impossible. He managed to catch hold of a tree-stump, but his two companions. less fortunate, felt themselves sinking. They struggled, but their- struggles only caused them -to sink still further, until at last the mud closed in round them and all that was left was one`hand, blue with cold, pointing to the sky. Can you imagine a. more awful death? The gratitude of the prisoner was, I believe, quite pathetic, and when he left the dressing station he tried to tip the M.O. two pfennigs, the total wealth that he possessed. This was only one instance of men getting lost in the mud, and on several occasions it took as many as twenty men pulling at an armoured telephone cable to pull one poor devil out, and when at last the mud yielded him up it would be without his boots, and several times I saw men who had been pulled out like this crawling down to the dressing station with bare feet through the mud and snow. Oh, it was horrible. I was on my way to a certain trench. It was mud over the knees, aid I could hardly make any headway. I met a Tommy carrying down a badly wounded man. We passed. Five minutes later about fifty yards separated us then - there was a terrific explosion, and a shell burst behind me. I ducked, when it was over I looked round. The Tommy was still carrying his burden,but from his own thigh there poured a stream of blood. He had been hit by the shell. He knew as well as I did that his best chance of life was to leave the wounded man and get to the dressing station as fast as he could. But he stayed, and agonising step by agonising step he carried his pal towards help. How will that man be remembered? As a hero, or as Pte. So-and-so, died of wounds? It is deeds like this which make the Honours Lists so tragic. Sergt. X. has won the. D.C.M. for some act of conspicuous bravery. You read further, and hear what the deed was. He has earned the medal. Always. But what about the other men who have done exactly the same act? What of the man whom you yourself saw doing it the moment before he fell? For one the D.C.M. For the other 'Missing, believed killed.' It does seem hard. Have I been altogether too gloomy? I'm sorry. And. I don't want you to get the idea that things are often as bad as they have been during the last week, because they are not. Barring a certain amount of unpleasantness the life is not so bad, but owing to several things, chief of which was the succession of snow and rain, following upon the pulverising bombardment, the conditions just on this one part of the line just for those few days were in the words of a man who, has been out since the start, 'worse than anything they ever dreamed of in the first winter.' One thing though, and that is that the Germans have been suffering far worse than we. All the time we were there we were hardly shelled at all, but our guns were going hard. We've got the shells, and we know we are winning now. We are now in the front line, and, I don't want to frighten you more than I can help, but I am responsible for all that lies between you and about three hundred yards of German hate. In other words I find myself a company commander. Isn't it deplorable, Phyllis, that the British Army should ever come to such a sorry plight as this. Me a company commander. It is quite a good line in trenching too, and we make a speciality of deep dug-outs. The company headquarters (stand properly at attention there and don't grin) is most salubrious, thirty foot underground, and with two nice little bunks in it. In one corner stands what once was a most select toilet table, whereat no doubt some French beauty communed with nature - and art. If it has any self-respect left it must have felt very ashamed at the Gold Flake [tobacco] tin which provided me with a wash, a shave, and a portion of a bath this morning, Water, except for the sort which grows in the bottom of a trench, is rather scarce, and has to be carried up in petrol tins. Consequently my man only allows me a tobacco tin full for my ablutions. In addition to having a whole company to command I have one elderly gentleman to instruct. Doubtless he is far, far above me in the Army List, but he is at present seeing life under my wing. He is fifty or thereabouts, quite old enough to be my father anyhow, and is bald and a sportsman. Also he sleeps all day. And most of the night. When he isn't eating, or scratching. The food is a bit of a come down after the luxurious life with the brigade. Yesterday my rations failed to put in an appearance, but nevertheless my servant produced an excellent breakfast of fried bread. After I had finished it I called him in and congratulated him on the success with which he had made a meal out of nothing. " Ah, sirrr," he exclaimed, " 1 thocht ye'd maybe like something a wee bit tasty for breakfast, sae I scrapit the grease off yon boots of yours and fried the bread in that." And I enjoyed it too. For the first two days I was up here, we were in support in quite the largest dug-out I have ever seen. At one end of it two companies lived in comfort, and at the other end were our quarters. And we used to think that a dug-out which held eight men was a large one. The only crab about it was the number of rats, but that seems to be the same all round here. The mice are a nuisance too, and if you like to send out a few traps you will earn my everlasting gratitude. Must go my round now. Your present of the mouse-traps synchronised (good word that) with our arrival at a mouse-infested dugout. In five hours my servant caught twenty-five mice and two small rats with the six traps. They now form part of our equipment, and travel with us everywhere. We are out of the trenches for a few days - we do eight in and six out now, but it's no hardship as they are such cushy trenches. Still, you do enjoy the few nights of pyjamas and the freedom from the ceaseless watch. We stay in a large house in the centre of the village, and sleep in one room, the six of us, and eat in another. The dining-room is decorated all round the walls with chalk drawings by a French soldier who was here before us. They are jolly good and very amusing but some of them mightn't meet with the approval of the Church Times. Badminton is our latest recreation, and we manage to get quite a number of games after parade hours. Out of the window I can see a game going on now.. The machine-gun officer, who has a good reach, is playing with the transport officer, who, has a true eye, against the quartermaster, a man with a strong wrist, who is partnered by the padre, who has a large stomach. Whoever plays with him has a hard job. We are also thinking of starting some cricket, as we have unearthed a bat and a ball from the tool chest of the Sergeant. Directly we get back from the trenches we have a bath, and I can tell you we need it after eight days. The baths are in a disused water-mill, and run by two light-duty men under the auspices of brigade. You bathe in half an old beer barrel full of topping hot water. It is interesting to see how the water changes colour too. The other day several of us were having a bath when along rushed an orderly with a gas alarm. We reached for our gas helmets, unrolled them and laid them down beside us and then proceeded reluctantly to dress. Five minutes later we dashed out of the baths, a weird-looking crew attired in each other's tunics, kilts and boots. ties, collars, and hose tops on anyhow. It was a false alarm. They always are if you take any notice of them. I'm just off to the dentist. He lives about seven miles away, and I've got to ride there and back on the company charger, which was chosen by my predecessor on account of its homely face and gentle gait. If it tries to trot it wobbles horribly at the knees, if horses have knees, but it is when it breaks into a canter that it excels itself. It throws itself several inches up into the air and comes down on exactly the same spot. On the whole I am inclined to believe that it moves fastest when it is walking. It can just about keep up with a column on the march then. I'd use spurs but I don't think it would be any use. Not that I care for spurs in the ordinary way. They are so dangerous. If you are walking you are apt to trip over them, and if you are riding there is always the danger that they will touch your horse. Still I suppose they look nice. P.S.-Wish I hadn't to go to the dentist. It is the first time I have ever been to an army one. I expect he will pull my teeth out by numbers.? We are staying at the principal estaminet in the place. The first floor has entirely disappeared, and so has the ground floor, except for a portion of the bar. So we inhabit the coal cellar. It is about ten feet broad and fifteen long, and has a coal-smeared arched roof strengthened by wooden struts in case it gets crumped. Along either side there runs a brick ledge, and along the brick ledge there run... - well perhaps we needn't go into that too closely. These ledges we have covered with sandbags and they make fairly comfortable beds at night and seats by day. You descend to this haven of rest down a flight of slippery stone stairs, but though it is so far down, the morning sun manages to find its way in, when there is any sun. Our furniture consists of one old oak table (a. genuine antique), a shake-down bed made of biscuit boxes and x-pip-emma, or expanded metal---to be more exact, and that is, all. Oh, and there is a telephone. but that is out of order, thank the Lord! Back here a "dissed" telephone wire is a blessing in disguise. "The RE. want a fatigue party of fifty men to help them with the new C.T.," says the adjutant. "All right," says the C.O., "detail them from B Company. ", The adjutant goes off to the 'phone and comes back with the news that B Company's line is "dissed." One of the other parties gets the job and we slumber on peacefully. This must have been a pretty little place at one time, but it has gone the way of all villages which grow a few hundred yards behind the trenches and are used as strong points. However, there are still some gardens in more or less good condition and, at any time we like during the day we can wander out unseen to pick daffodils in the grounds of the ex-chateau. But it is at dusk, when the Geman,lines are gradually fading away into the evening shadows, that 1 like to get out and wander through the padre's garden, Which by way is in full sight of the Hun. Along deserted gravel paths, now sprouting with new green grass borders of the most beautiful white narcissus on either side, through sheltered walks fragrant with violets , into the fruit garden, a mass of pink and white blossom. There I love to stay and watch the setting of the sun and the first gleaming white lights shot up by the anxious sentries at the foot of the hill. And when I begin to feel too sentimental I pull myself together and loot a bunch of spinach and the best of the rhubarb for our dinner. The spring onions are nearly ready, and the asparagus won't he long now. It is rather a find for me, as when an orderly comes along from Battalion H.Q. with a bit of a stinker in the way of chits, please explain delay and all that sort of thing you know, I send him back with a soothing answer, and a prime cauliflower. They are beginning to count on me for their supply of "vegs". We had a bit of a scare the first night up here. just as we were going off to sleep a terrible racket started, and my servant fell downstairs in his eagerness to tell me that a mine had gone up some way to our left. Our job here is to check the victorious Hun, flushed with success at having broken through our trenches, and to drive him back to his spiritual home like melting snow on a summer's morn. Like antelopes we sprang to our posts, shivering with - no, not fear - cold. Around us the shells burst in myriads, one was not three hundred yards away, but undaunted we stuck to our posts, holding the fort, and throwing suitable portions of the chalky substratum at the rats who we could hear nibbling away at our barbed wire defences. Heroes all. Us, not the rats. At four o'clock everything was quiet again, and we went off to bed. We never heard what it was that happened but it was probably a very minor affair. I must stop now as I have important work to do. PS. Last time I had the same important work to do Iforgot to take the cards with me to the bombing officer's place and had to come back and get them. The Front Line, May 22nd. I'm feeling about as courageous as a jelly-fish. In this sector of the line there are some mine galleries, and the Hun knows it full well. And as Fritz has a rooted aversion to taking a toss at the hands of a mine, he is at great pains to prevent any unseemly underground disturbance of that nature. His aversion has taken the concrete form of a giant trench mortar which fires enormous aerial torpedoes at us from eleven hundred yards away, despite the attentions of our artillery to its supposed lair. And of all the damnable inventions of this war the trench mortar, especially the grown-up sort, is the most damnable. I have seen men so shattered by the concussion of one of these blighters that all they could do was to sit down and weep by the hour, and 1 saw some German prisoners, taken on the occasion on which we first used our new machine, who, were worse still. They were clean dotty. Well,this big'chap has been going strong at the mine galleries ever since we came up into the front line for this trip, and as company headquarters is situated plumb in the middle of the galleries we are having no end of a time. If they start strafing a bit of trench it isn't so bad. You can always move away to one side, but company headquarters is the first link in the chain which connects the bomber in the advanced sap with the General Staff at the War Office, or the Daily Mail, or whoever it is that is really running the war. And so you must have some one there. To-day we should have had to stay whether we liked it or not, as the first three bombs smashed the trenches to bits on either side of us and blocked up the C.T. [Connecting Trench] to the rear. To get away from the dug-out we should have had to climb right over the blockage, and that would have been "finee" for us. So there we sat for several hours, while the dug-out shook from side to side. Occasionally a more than usually near explosion would fill the whole room with choking dust and smoke, but for the most part they did nothing but make the dug-out rock to and fro. The breathless waiting for the next one to come is the most horrible part of it. To your straining ears there. comes a faint pop, and you know that it has started. You do not actually hear the bomb until it is on its downward course. Then you can just make out a faint sssssssh, like the wind whistling among the trees. It grows louder and louder, and then stops with a plop as the bomb hits the ground. A fraction of a second later comes the explosion, an indescribable nerve-shattering explosion which tears down every thing within five yards of it and pulverises trenches. revetments, or anything which tries to withstand it. Oh, it's horrible. But as usual there is the light side, and to watch people hairing down the trench away from the falling terror is one of the most amusing things I know. All the more so if you happen to be one of them and you find yourself alive at the end. But what has made our nerves more fuzzy than any else had nothing to do with the trench mortar. The strafing had ceased, and we were putting on our helmets with a view to going out and gathering up the fragments of our trench when there was a bang outside, and suddenly we were in the midst of a great hissing roaring inferno. Everything seemed to be going round, and from the door came an overpowering red light and wave after wave of acrid smoke. " Bombs," cried my servant who was in the act of laying the table. And here I regret to say that no one dashed to the rescue and flung himself upon the box of ignited hand grenades. No one was out for the V.C. And besides it wasn't bombs at all, but our rockets. A red-hot, piece of shell must have swished downstairs and landed up in our box of S.O.S. rockets standing at the foot of the stairs. The show lasted for about five minutes, during,which time the dug-out seemed to be full of flying screeching red rockets and blazing green stars . We put our hands to our mouths to try and keep out the smoke, and resigned ourselves to fate. As it so happened nothing did hit us, for the box which held the rockets was on the lowest step of the stairs and out of sight of the far corner of the dug-out. But only by a few inches. People who were outside say that it was a grand sight, long tongues of red flame, and clouds of smoke issuing from the dug-out and visible for miles. They seemed to think it was rather a joke. And so may we. After the war. Sorry to have discoursed at such length upon my own sufferings, but they are all over now, as we are to be relieved at dusk. PS. I have decided that it is more suitable for the S/O/S. rockets to be keptin the sugnaller's dugout. In future they shall be. This is a startling change in my address, isn't it? But it's all for the best I can assure you. About a week ago the M.O. came up to me. 'Is there anything you'd like better than a month's rest ? ' said he. 'Why yes' I replied, 'two would suit me better.' 'What do you say to a month's advanced infantry Course?' 'I'm on', but 1 don't know how to form fours'. 'That's all right. The C.O. said that I better know who's most in need of a rest, as he has to detail someone some one to go to this course." And so here am! Lord, Phyllis, they do get rattled if you suggest down here that you are having a rest. They to think that it is hard work to drill and mess from nine to five, but I'd drill for longer than that if at the end of it I knew there was a good dinner a nice bed with white sheets awaiting me, as there this case. We are a funny collection, one captain from each battalion in this army. Old captains, young captains. fat captains, thin captains, captains in fact of all sorts, shapes, and sizes. Some of them are regulars, some Territorials, and some Kitchener's Army. Some have rows of ribbons, others have very new-looking braid on their sleeves. But to whatever species we may belong it makes no difference. We are divided up into squads of about twenty, and carry rifles and have to look as military as possible, which of course is hard on some of us. There was great indignation on the first day when it was seen that we had to rise up the next morning at six-thirty to do simple rifle exercises. Wasn't this to be an advanced course, and besides hadn't we been teaching men to slope arms for years and years, not so many years perhaps for some of us, and to suggest that we couldn't do it ourselves was a downright insult. But when the morning came and we fingered the great clumsy things, which belonged by rights to our servants. there were a few of us who began to doubt our capabilities, and when the dread word was given, 'Slope arms,' our actions would have shamed the rawest bunch of recruits alive. From Captain Oldboys, who did it like this in the Militia fifteen years ago, to Captain Wheeler of the Divisional Cyclists, who had never doe it at all, nearly everybody was hopelessly wrong, and it was a very chastened gathering which slunk into the mess-room for breakfast. Altogether we are having a topping time, and are relearning a lot which has leaked out of our minds during the weary months of trench warfare. The whole thing is rich in humorous incidents, in fact they are so numerous that I can never stop laughing when.I am supposed to be standing rigidly at attention. To look down the line and see the reassuring abdomen of old K--- sticking out in front of the rest of the line, like a pronounced salient, is enough to send me into a fit of giggles of which the silliest schoolgirl would not be ashamed. It is just like being at school again except that you don't run the risk of being caned. In the afternoons we listen to lectures, at least all of us listen to some of the lecture, and some of us listen to all of the lecture, but some, I fear, overcome by the heat and a good lunch, fall asleep. This afternoon, for instance, the lecture was rather a dull one and the afternoon very warm. Gradually that after-dinner feeling, combined with the monotonous voice of the speaker, began to tell, and after half an hour hardly a soul was awake. Most unexpectedly the lecturer made a joke. One man heard it and laughed. The man next to him on either side woke up with a jerk and asked what it was all about. When he had whispered it to them they laughed, and woke up their immediate neighbours. At the end of five minutes the whole hall was awake and laughing. It was awfully funny to notice the way in which the laughter swelled as the story was spread round the awakening multitude. I had a good opportunity to hear it, for I was the one most sufficiently awake to hear it originally. I was sitting directly in front of the commandant. Perhaps that explains my wakefulness. Most of the lectures are very good though, and the speakers are all men who know what they are talking about. The only fault which they share is that each man considers his own subject to be the most important of the lot, but perhaps that isn't a fault after all. The result is amusing. Every lecturer finishes up in very much the same way. 'There is one thing which will win the war, and that is...' and here the lecturer mentions the subject on which he is speaking, be it map reading or sanitation. The country round here is simply topping. On all sides wooded hills and fertile plains, cornfields dotted with poppies and vivid yellow patches of mustard. Down in the valley is the sleepy little town, and through it winds a sparkling trout stream. A day or two ago we had a bus ride through a great forest and came back in the moonlight. The object of our joy ride was to visit an old farm and to prepare a defence scheme. In these defence schemes we are quite little generals as we are allotted infantry by the thousand, not to mention guns and cavalry (all imaginary by the way). However, it is, a very pleasant way of spending the time, and if it isn't a rest I never want one. Am just off for the week-end to Tr�port. This is a very advanced course. Still here, and having a great time. we have just returned from the attack of an enemy's position, a line of white flags funnily enough, and are feeling a bit limp, as it has been a sweltering day, and they seemed to think that we ought to double about eagerly. They don't seem to realise that we art here for the rest. It is a bit harsh. I was in the supporting line which merges with the firing line just before the final charge. After we had been going some time I found myself lying next to a man whom. I knew to have started with the first line. When I had recovered breath from the short sharp rush I asked him what he was doing. 'Can't you see I'm looking up, into the sky?' said he. He certainly was, his head on, his hands, in a position of ease. I rather fancy that his eyes were shut when I flopped down beside him. 'Well, I've been detailed to look out for hostile aircraft.' he explained, 'and this time his eyes really did shut. A little further on I came to still another man apparently asleep, but this one was lying face to the ground. As I flopped down beside him he turned to me. 'Sssh, I'm listening for sounds of enemy mining.' and he shut his eyes and went on slee--- listening for sounds of enemy mining I mean. I felt inclined to join him, but just then I noticed a member of the instructional staff bearing down upon us, so I continued my advance. The final assault was a very ragged affair. 1 was a bit blown myself and thought that if when the moment came to charge I didn't double very fast it wouldn't matter very much. Unfortunately everybody else seemed to have had the same brain wave, and the impetuous charge started off as a j*og-' trot and ended up as a walk. Still, as my next door neighbour remarked when we were getting slanged for slacking, we took the trenches all right, so I don't see what all the trouble was about. I'm feeling altogether too moist to go on writing, so au revoir. This is the last Sunday of the course, and I'm feeling rather depressed to think that this month's holiday is so near its close. It has been great fun, and in a quiet sort of way we have learnt a good deal. I am writing this on the cricket field (sic) where we have been playing a match. I made ten, so you will see that my batting has improved a good deal since pre-war days. The first ball went for six in the direction of square leg. The second was a four over the wicket-keeper's head, a rare shot, and the third ball was correct in direction and elevation so I thought it about time to take my pad off (we only go in for one these days of economising and write you. I bet you are all awfully excited about the Push. For days we could hear the rumbling of the guns, thirty miles away at least, and we all knew what was coming and more or less where it would be. But none of us knew when. Yesterday night came the news that it had started, and though we seem to have done well it doesn't look like a break through. Whenever there is a push people get too sanguine and think that we shall be in Brussels in a week and on the Rhine in two, but I very much doubt whether the object of this little show is really to break through. If we can kill and capture Huns galore and give them absolute Hades for several months it ought to give him a big shaking and at the same time give our army the experience which at least half of it hasn't got. Still, we shall see. They manage to keep things a bit more quiet than they used to, though a certain amount did get out concerning the Push. The news would probably come up with the rations, the quartermaster having been told by the A.S.C. supply officer. Your post from home would contain one or two references to it. From the Casualty Clearing Station would come tales of extensive preparations to receive wounded. All these signs might be mere coincidences, but when you saw the cerise band on,the hat of an elderly gentleman walking round the trenches you knew that the worst was in store. For the D.A.D.M.S., short for Deputy Assistant Director of Medical Services, is the stormy petrel of the Western Front. Whenever he appears in the front system there is trouble ahead. He comes into your dug-out and says a few well-chosen words on the sanitation, or lack thereof, in your trenches, but all the time his eye is roving round your abode deciding how many stretcher cases could be accommodated in it. And sure enough, in an hour or so after he has gone there comes along a chit from battalion H.Q. saying that your happy home is to be turned into an advanced aid post, and will you please clear out of it forthwith. Then its a foregone conclusion, and you are quite prepared for the summons to meet the C.O. in his boudoir with all the other officers and have a large document, labelled "secret and confidential" in blue pencil, read to you on the subject of your assaulting the Gerenz trenches, marked in red on a near date and at a time to be communicated later by special messenger. But this time everybody knew that it was coming, no one could say when or exactly where. The Huns seem to have had a rough idea, pretty rough in fact or they wouldn't have kept three battalions of the best selected Prussian Guards in the sector directly opposite us, one poor little Territorial battalion with no intentions whatever of attacking them. I shan't write to you again until I am back with the battalion, who, by the way, seem to have stuck fast in the same trenches. They haven't been out since I left them. Guess they are getting a bit dirty this dry and dusty weather. But we have had a job getting here. As you can imagine, our feet were about as soft as they could be after practically a whole month in the trenches, and with wet feet for the last week of that. The first day we only did ten miles, but it seemed like fifty, and every day since then we have been doing our fifteen or twenty, and curiously enough feeling fitter every day. One day we slept in a topping little village given over to the cult of the cherry. The old man of the house seemed to like us, and we lived entirely on luscious white-hearts in consequence. Our next halt was at a little place of a few hundred inhabitants, and the accommodation was scarce. Poor old C--- dropped a brick here. The QM showed him the house at which he was billeted and he approached it, thinking out the French for 'Can I sleep here?' The door opened and revealed a buxom wench. In jis polite, old fashioned way C--- bowed. 'Est-ce que je puis me coucher avec vous?' he enquired. I fear that he will bear the marks of that woman's finger nails until his dying day. That illustrates the old adage about the danger of a little knowledge, doesn't it? I can't remember all the places at which we stopped but we have been going strong ever since the 13th, six days of the intense loathing for the man who invented equipment. Now we seem to have settled down for a rest, and the men need it. As for myself, it seems to he nothing but rests now, doesn't it? At any rate I'm going to have a good old lie in bed tonight, and nothing will get me up before 9 am, I'll carry on with this to-morrow. I was going to lie in bed till nine o'clock, wasn't I ? Well at nine o'clock I was thirty miles away from the bed which I crawled into at eleven pip-emma. I had only just shut my eyes when a knock came at the door and an orderly entered. 'Battalion to be formed up ready to move by midnight, head of the column opposite the market cross, D Company leading.' and he had gone. Well you know what's coming, just as well as I did and here we are in billets (billets means the old German front line) and bang in the middle of the Big Push. We started to march just about midnight The men of course had no food since tea, time. At two-thirty we indeed were at a station and waited in the cold for an hour or so till the train came. When everybody had been crammed in, eleven and twelve to each compartment, we started, and travelled till about ten. Then we fell out of the train and found ourselves standing beside a large wire cage full of Huns. 'Hello, Jocks,' cried one of them, 'glad we're not you.' We marched out of the station and along a dusty road. Coming in the opposite direction were bus loads of slightly wounded, as happy as men could be, singing and joking, laughing and talking, bound for Blighty. I'm afraid I envied them. After we had been marching for half an hour a halt was -called, and Ihe-billeting party went on ahead. We lay down by the side of the road, spat the dust out of our mouths, and wondered how long they would be settling up our billets in the village just ahead. We formed up and moved on. No billeting party to meet us at the edge of the village.. Or in the middle of it. Or at the further end of it. On we went, feeling absolutely done in. In front of us stretched a great dusty road, but no sign of our billeting party. An hour went by and we had a ten minute-halt. Packs were thrown off and a large number of the men fell fast asleep. Then on again for another hour and an other rest. Then-on again for another hour and another rest. Then on again. On either side of us bivouacs were springing up, and soon we were marching through an'unending vista of wagon lines, bivvies, and ammunition dumps. Strings of horses, Several hundred at a time, passed,us on their way to Water, and a little band of weary prisoners shuffled along, guarded by a single Argyll and Sutherland Highlander. Suddenly we saw that longed-for sight, our billeting party, Which side of the road was our resting place to be ? Then -came the disquieting rumour that we had still five miles to go. The rumour was true, and it was not till four in the afternoon that we arrived at these trenches, our billets for a day or two. And then? I'm going to turn in now and get some sleep while I can. There is a fifteen inch-gun within fifty yards of us, and it makes a terrific row when it goes off, but I shall be able to sleep through absolutely anything. We are off into the thick of it this evening, up to that ill-fated wood half a mile in front of the rest of our line, so we shall see life with a vengeance. Did I ever tell you about L� who, was at the Infantry School with me? On the day that the Push started he broke his ankle playing football against the A.S.G. Now I hear that he arrived with the first batch of Somme heroes at Charing Cross [station], and was liberally strewn with roses while he was pulling the blanket all the more closer round him, so that nobody should notice that he was still in footer-clothes! All the way over, so he must have have felt a fool. I have been too weak to write and tell you that I'm all right, but my troubles are over now I think, and I'm feeling ever so much better. The last few days have been rather, sketchy ones as far as I'm concerned. Endless journeys in bumping ambulances (I always used to think an ambulance had springs) some one standing over me and saying, 'Breathe in, breathe in,' nurses asking me if I felt better now, and above all incessant enquiries as to my name, rank, regiment, age, service, and those two concluding grisly questions, religion and next of kin. Otherwise nothing much. Of those up in the wood I can't write now. They say that I should get home in a few days. Till then goodbye. Isn't it a dreadful war? Norman Down subsequently served in the Middle East and wrote a second book called Temporary Crusaders (online in the WW1 Archives at BYU) in 1920 under the same Nom de Plume. Norman Cecil Sommers Down, who was a civil servant prewar, eventually became Senior Principal Inspector of Taxes, Board of Inland Revenue, and was awarded the CMG in 1947. He died in 1984, aged 91.